Our classrooms include a range of education and social activities that are built to match your child's age and development. We strive to find the best fit for your child so that they can grow and learn at their ideal pace. The White room starts your child’s educational journey in a nurturing Christian environment. We provide fun learning experiences that encourage your child to explore their environment and interact with their peers and teachers, which allows them to grow socially, emotionally and spiritually. At this age, your child is growing at a rapid rate, and as they grow and develop the teachers weekly lesson plans are purposeful and intentionally created to meet each child’s needs as well as interest based on the teachers observations in the classroom. The program in this classroom focuses on developing pre-writing and pre-reading skills in an environment enriched with age appropriate hands on experiences, and a curricular program based on the California Preschool Learning Foundations. It focuses on encouraging self-help skills such as dressing, eating, verbal expression, manners, and eye-hand coordination while also beginning skills of recognizing letters, name in print, and identifying sounds in the environment and in speech. 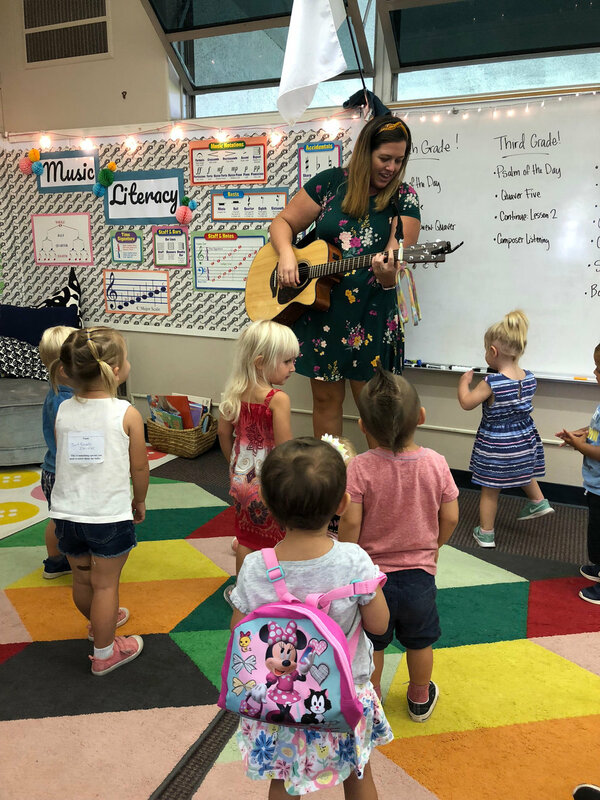 The program in this classroom focuses on developing skills with age appropriate hands on experiences, and a curricular program based on the California Preschool Learning Foundations. Students will begin learning how to use scissors, cut out simple shapes, recognize letters and their corresponding sounds. They will also build foundational skills for future education as they are exposed to math, cooking, creative art, gardening, and writing. The program in this room focuses on building social and emotional skills within a christian environment. Students learn how to use scissors, cut out simple shapes, recognize letters and their sounds, recognize their name, and trace and write their name. Students learn early math skills such as patterning, sorting, graphing, recognizing numbers, counting to 10, and one to one correspondence. The learning environment is enriched with faith building lessons and activities which focus on The Fruits of the Spirit, morning and snack prayer, and weekly chapel. There are many hands on experiences and opportunities to learn about things such as cooking, creative art exploration, gardening, weather, family and friends. Students in the Violet Room learn how to establish positive relationships with their peers and how to build lifelong social skills. The Lime Room is designed to provide a well-rounded experience for your child. Our planned curriculum encourages them to develop the skills they need to build a strong foundation to succeed in kindergarten. This hands-on curriculum focuses on these areas of development: spiritual growth, social and emotional development, language and literacy, math, science, art and music. Building on each child's unique strengths and capabilities, this program is tailored to meet the needs of each child and help them develop essential skills that will last a lifetime. The Lime Room teachers are dedicated to help your child grow to reach their full God-given potential.